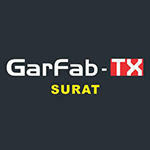 "The exhibition on Garment, Embroidery, Textile, Processing Machinery, Fabrics and Accessories"
Garfab-TX Surat is an event featuring textiles, embroidery and handloom industries. The event focuses on latest technologies that help garment and apparel industry flourish. The event involves more than 70000 looms and more than 100000 embroidery machines. The visitors can shop at booths and learn about textiles and garments materials and yarn fabrics by attending various seminars conducted by professionals. Students are most welcome who want to establish their businesses and partner with small cottage industries. This is a must attend for all textile designers and fashion designers as the event exhibits purest and unique raw materials creations from different parts of the world. Business building classes and textile classes are also conducted at this event for students who are willing to work in garments or fashion business. It was really good but please specify that this exhibition is for machines not for garments. People like us didn't knew about it. This time Garfab missed on several products, the machines focus was only embroidery and digitals, nothing new. Performance below expectations. Exhibitors profile include Apparel, Leather, Knitting & Jute Technology : Weaving, Texturising, Dyeing, Finishing, Colour matching, Lab equipments, Printing , Yarn, Fabrics, Threads, Button, Zipper, Interlining Embellishments.